Ashgabat, Mar. 17(BNA): The joint Bahrain-Turkmen Business Forum has started its meeting this in the capital of Turkmenistan, Ashgabat. 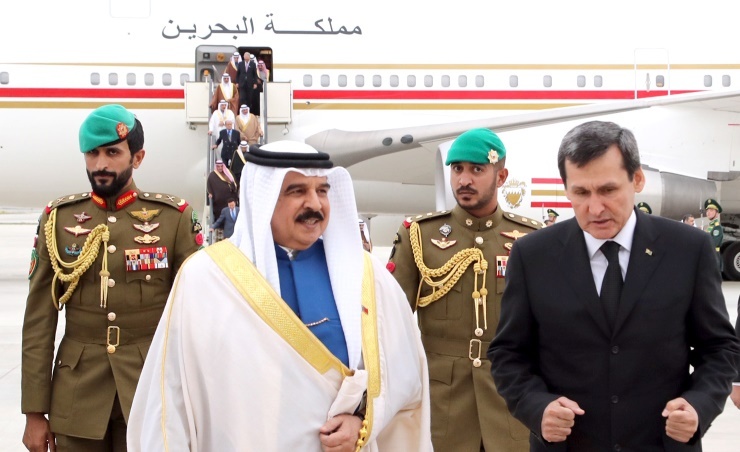 This came on the sidelines of the visit of the His Majesty King Hamad bin Isa Al Khalifa to Turkmenistan, at the invitation of President Gurbanguly Berdimuhamedow. Industry, Commerce and Tourism Minister Zayed bin Rashid Alzayani attended the symposium as a keynote speaker. Bahrain Chamber of Commerce and Industry (BCCI) Chairman Sameer Abdulla Nass signed a memorandum of understanding with the Turkmen Chamber of Commerce and Industry. Industry, Commerce and Tourism Minister Zayed bin Rashid Alzayani and Minister of Trade and Foreign Economic Relations Amandurdy Ishanov attended the signing ceremony. The Gulf Petrochemical Industries Company (GPIC) President Dr. Abdulrahman Jawaheri signed a memorandum of understanding with the national gas company of Turkmenistan Türkmengaz to study petrochemical projects. He also signed a second memorandum of understanding Turkmen state-owned company Turkmenhimiya in the field of fertilizers. The signing ceremony was attended by Oil Minister Shaikh Mohammed bin Khalifa Al-Khalifa and Minister of State and Türkmengaz Chairman Myrat Archayev. Addressing the forum, Industry, Commerce and Tourism Minister Zayed bin Rashid Alzayani highlighted the 2030 Economic Vision, which is based on three key pillars "Sustainability, Competitiveness and Justice", to shift from oil-based economy to productive and competitive one. He underlined Bahrain’s strides over the past decades, stressing the drive of the Government, chaired by His Royal Highness Prime Minister Prince Khalifa bin Salman Al-Khalifa to spearhead giant development projects since the 1960s, citing Aluminum Bahrain Company (Alba), in addition to massive investment in the banking and telecommunication sectors as part of efforts to diversify the non-oil economy. The forum was attended by representatives the public and private sectors in both countries and senior officials within the visit of His Majesty King Hamad bin Isa Al Khalifa to Turkmenistan, at the invitation of President Gurbanguly Berdimuhamedow. The forum was also attended from the Bahraini side by Industry, Commerce and Tourism Minister Zayed bin Rashid Alzayani, Oil Minister Shaikh Mohammed bin Khalifa Al-Khalifa, Electricity and Water Affairs Minister Dr. Abdulhussein bin Ali Mirza, Bahrain Gas Company (Banagas) Chief Executive Officer Shaikh Dr. Mohammed bin Khalifa Al-Khalifa, CBB executive director for banking operations Shaikh Salman bin Isa Al-Khalifa, Bahrain Chamber of Commerce and Industry (BCCI) Chairman Sameer Abdulla Nass, Gulf Petrochemical Industries Company (GPIC) President Dr. Abdulrahman Jawaheri and Economic Development Board (EDB) Chief Executive Officer Khalid Al-Romaihi. BCCI board member Basem Al-Sae moderate a discussing session highlighting investment opportunities Bahrain. The session was attended by Economic Development Board (EDB) Chief Executive Officer Khalid Al-Romaihi, (Banagas) Chief Executive Officer Shaikh Dr. Mohammed bin Khalifa Al-Khalifa, CBB executive director for banking operations Shaikh Salman bin Isa Al-Khalifa, A second discussion session was also held shedding light on business and investment opportunities in Turkmenistan. The forum stressed the importance of joint cooperation in organising exhibition and conferences, creating export opportunities and setting up joint ventures and bolstering business ties. The symposium highlighted the potential of Turkmenistan in key sectors which include oil, gas, food and textile.